This morning's debate was rather disappointing. I wonder why President Obama wasn't more aggressive. Does he want Romney to take his office? If Obama cared a hoot, he should have taken Romney to task over his many recent gaffes. Instead, he let Romney off scott-free and even allowed him to tread his agenda. Format of the TV debate not withstanding. I would have been more forgiving if Obama wasn't a trained as a lawyer, but he is. And I can understand one has to be civil and polite and all that, but Obama's body language was too friendly in greeting Romney. Come on, here's a man who has been telling America that he has been a lousy president. Yet Obama receives him like a long-lost brother. Who is the office bearer here? Obama has to demonstrate a few strong emotions. 1. That Romney's version of government is no different from Bush Jr and will continue to bankrupt America. In fact, Romney doesn't know what a government is. It has to govern in an inclusive manner, not one that's biased towards defence (GLCs? ), big business, and the other "47 %", etc. 2. That greater military spending will seriously rob funds that could be allocated to government services and departments. Romney's approach doesn't come across as fiscal prudent bush still Bush Jr cowboy. They remind me of emperors vained by a large army and not afraid to use it. Very imperialistic. Do the Americans know how to govern at all? Look at the U.S.'s many bankrupt and near bankrupt states. And the poor condition of its many inner city schools. America cannot afford any more military adventurism now or in the near future. The country has to get its house right. Rebuild its coffers, get its kids better educated, show leadership in sci-tech again, etc. Military-wise, it already bristles with leading edge in many technologies. And respected. No need to go flexing its muscles around the world. Effective diplomacy is the way. For example, U.S. and secular democracy could have been advantaged by Arab Spring, but instead, the U.S. squandered the chance by engaging the ruling elements. This left the secular activists out in the cold. The result? Muslim radicals and their rectoric have taken their place. 3. Obama has countered point 2, but he has to use stronger language to demonstrate that he knows what government is all about. After all, he has had four years of experience. Romney has got none. 4. Defend his economic and jobs record. Come on, it is national TV. Remind the folks at home that economic times have changed. Know that and get on with it. Obama has to keep reminding Americans how to deal with that. Him failing to do so - without a clear agenda - makes folks think he is an ineffectual leader. When times are tough, folks like to hear from their leaders. They like someone to tell them there's light at the end of the tunnel - just like Churchill in WWII. Rouse the folks, implore them to dig in. Keep them focused on the healing/recovery path, even if it's not so smooth. 5. That he knows how to engage the world. Romney has no foreign policy. Obama should have skewered him on this. In fact, Romney's trip to Europe was so bad he came across more as a tourist than a statesman from a superpower. And Romney seems as intellectually dull as Bush Jr in matters concerning foreign policy and current affairs. When things get tough Bush Jr retreats his ranch to yahoo. What will Romney do? Seek solace in his investment portfolio? 6. Obama should have used the occasion to defend the dirt hat has been chucked his way up to this point in the campaign. In a national debate, gloves are off. Either come out fighting or not. President Obama has to wake up or else he is going to squander whatever poll leads he has gained in the last few weeks. 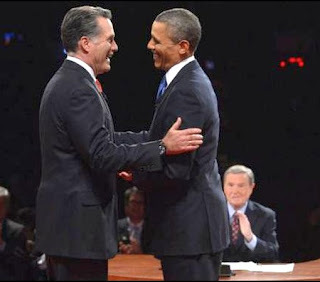 The U.S., indeed the world, cannot have another clueless chap like Bush Jr. in the form of Mitt Romney. The GOP seems to keep offering candidates that are less and less worldly. Even less intellectual and educated in business of governance than the Democrats. At least that how it is appearing to folks like us in this region.